After three long years of campaigning, petitioning, coalition-building, meeting with elected officials, and sitting on committees, we won a reduced fare for low-income riders! 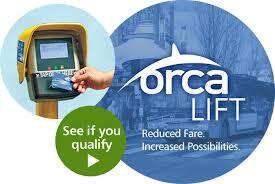 King County’s pioneering ORCA LIFT program, nearly the first of its kind in the U.S. and still the largest low-income fare program in the country, began in March 2015. 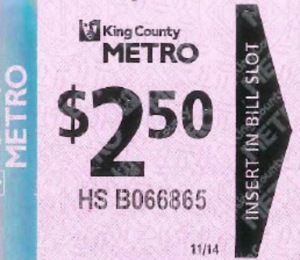 In fall 2014 TRU sent a letter, signed by over twenty social service organizations, urging King County to expand the Human Services Reduced Fare Bus Ticket program to make more bus tickets available for organizations to purchase and distribute to the very low-income and homeless people they serve. The County Council responded by passing legislation that increased funding for the bus tickets program by 33%! 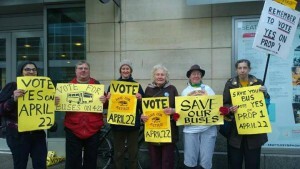 TRU has campaigned to Get-Out-The-Vote for several ballot measures to preserve, expand and improve public transit. Seattle’s Transportation Benefit District Proposition 1, to expand bus service, passed in fall 2014; the Move Seattle Levy, to repair and improve Seattle’s transportation infrastructure, passed in fall 2015. Throughout our history, TRU has been vocally critical of regressive funding sources like sales tax and flat car tab fees, which hit working and low-income people hardest. 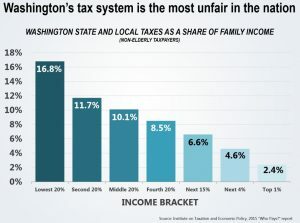 We have continually and consistently pushed for more progressive transit funding at both local and state levels, and for broader reforms to Washington’s regressive tax system. This is an uphill battle, with no solid victories on this score yet, but stay tuned! In 2015, TRU organized with students at Rainier Beach High School, and together we won $1 million per year to fund transit passes for low-income high school and middle school students! The program went into effect in 2016, and TRU continues to work with students and educators to improve and expand it. We would like to see free transit for all youth. 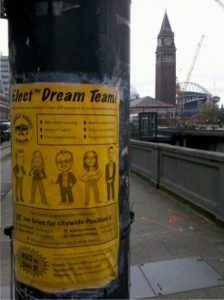 In fall 2015, TRU campaigned for a “Dream Team” of progressive candidates for Seattle City Council. We plastered the city with posters, distributed thousands of newsletters and flyers, talked with hundreds of transit riders, and held ballot parties and rallies. Three of the five candidates we endorsed were elected! 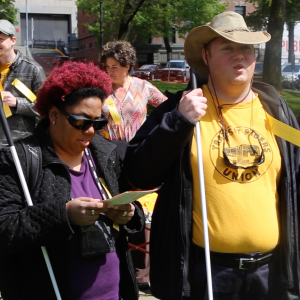 TRU’s blind and visually impaired members have driven our ongoing efforts to push King County Metro to improve the automated announcement systems on their buses, so that all riders have accessible information about stops and routes. In fall 2015 Metro began making big improvements their interior stop announcement system. 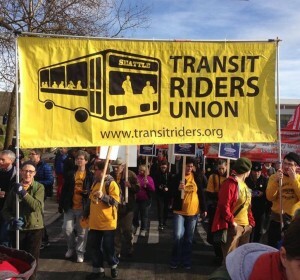 TRU helped to pressure Sound Transit to extend a low-income reduced fare to all their services. 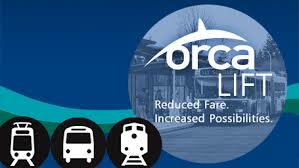 Starting in March 2016, ORCA LIFT expanded to include Sound Transit Express Buses and Sounder Commuter Rail. TRU took the lead and coordinated the production of a new and much-needed Seattle Transit Map, created by Oran Viriyincy and supported by the Seattle Department of Transportation (SDOT). The first print run took place in March 2016. 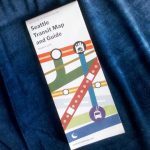 Seattle transit now has a map! 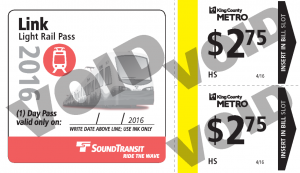 In 2016, TRU pushed Sound Transit and Metro to find a solution that doesn’t leave riders who depend on bus tickets with second-class service, since the tickets aren’t accepted on our region’s growing light rail system. We started a petition and announced a rally and direct action, and very quickly the transit agencies created a new combo-ticket that does the trick. TRU continues to push for more accessible and affordable transit for very low-income and homeless riders. Last but not least, TRU has stood up in solidarity with countless organizations and causes! 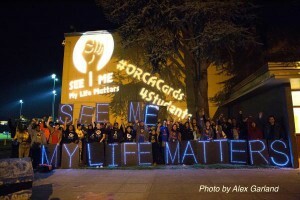 In 2015 we mobilized to stand with Macy’s workers, Amazon security officers, Uber drivers, janitors, UW workers, nurses, the homeless community, low-income tenants, immigrants, Keystone Pipeline activists, & the Black Lives Matter movement among others! Solidarity is one of TRU’s most important functions. With your help, there will be many more victories to come. Make a donation or join us today!